VIDALIA, GA — It has been rumored and discussed on the streets here for months that the Seattle-based Bill & Melinda Gates Foundation or Cascade Investment LLC, the Gates' private trust located in Kirkland, WA, is actively seeking to purchase producing farms in the Vidalia area, renowned for its sweet onions and the center of that industry. Already, two entities — Coggins Farms in Lake Park, GA, and more recently Stanley Farms and its subsidiaries in Lyons, GA — have been sold and, while the trail is murky, documents and interviews with other Vidalia-area growers link the purchases to Kirkland and seemingly to Gates. The Produce News recently obtained a copy of a letter written by Stanley Farms General Manager Vince Stanley to vendors and suppliers dated Oct. 1 and headlined, "Re: Change of Ownership." An included W-9 IRS form showed that while the business name of the operation is Stanley Produce Georgia LLC, the owner is the Mt. Hood Administration Trust, with a listed address of a post office box in Kirkland. There is no readily available information on the trust. Stanley wrote, "On Oct. 1, Stanley Produce Georgia LLC purchased the interests of [Stanley Farms subsidiaries] Vidalia Valley, Manning Farms and Vidalia Onion Farms. Please accept this letter as notice of such a change. The Stanley Family wants to personally let you, our valued customer, know that the entire staff you have come to rely on will 100 percent stay in place and will only add quality folks to better serve you!" One visitor to the Stanley Farms Facebook page posted two questions about the sale, the second of which read, "Is or has Bill Gates already bought your farm business via Cascade Investments...? Seems he already bought Coggins Farms awhile back." Neither post had received a reply as of Oct. 13, when The Produce News' queries regarding the sale began; by mid-day Oct. 14, both posts had been removed. The Produce News contacted the Gates Foundation, Cottonwood AG (based in Naperville, IL and thought to be an agricultural assets management operation for Gates' interests) and others Oct. 13, but there were no replies to requests for information or interviews. Derek Yurosek of Cottonwood AG, whose name has been mentioned by several Vidalia growers as a participant in some of the proceedings and whose LinkedIn profile shows a Kirkland address, forwarded The Produce News' email seeking information to several other Cottonwood AG email addresses and others from Los Arboles Management LLC, which also has a listed address of a post office box in Kirkland, albeit a different one. His message atop the email simply read, "Please do not respond." It is unclear whether Yurosek intended to copy The Produce News on that email. While the Gates connection is still just rumor to some, others claim more intimate knowledge of the dealings. "I've actually met with them," said one well-placed grower who asked to remain anonymous. Gates' agricultural interests are well-known. He has been an active and ongoing crusader in developing countries, helping provide locals with means of improving subsistence farming operations. 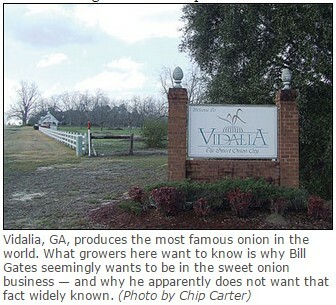 What everyone in Vidalia would like to know is why Gates seemingly wants to be in the sweet onion business — and why he apparently does not want that fact widely known if that is indeed the case. LIVE OAK, Fla. -- The investment company that manages the wealth of the world’s richest man, Bill Gates, has been acquiring gobs of farmland in north Florida the past two years, real estate records show. Lakeland Sands Florida, a subsidiary of Cascade Investments LLC, which oversees the Gates fortune, recently bought more than 4,500 acres in Suwanee County near McAlpin, an unincorporated community just south of here. The price: $27,961,144.69, according to court records. The farm land was sold by Seldom Rest Inc., an agriculture and forestry company based in Donaldsonville, Ga. John S. Bailey, the company’s vice president, declined to comment on the transaction. Lakeland Sands has also acquired an abundance of properties in other parts of Suwanee County and in Hamilton and Madison counties, which abut the Georgia border, since 2012, public records disclosed. Brothers Chris and Allen Heine, owners of Oak Hammond LLC, sold 400 wooded acres in western Suwanee County to Lakeland Sands for $800,000 in September of 2013 not knowing who was behind the purchase. The brothers said they had owned the land as an investment and cleared it of trees before the closing at the request of the buyer, assuming Lakeland Sands was either in the timber or farming business. 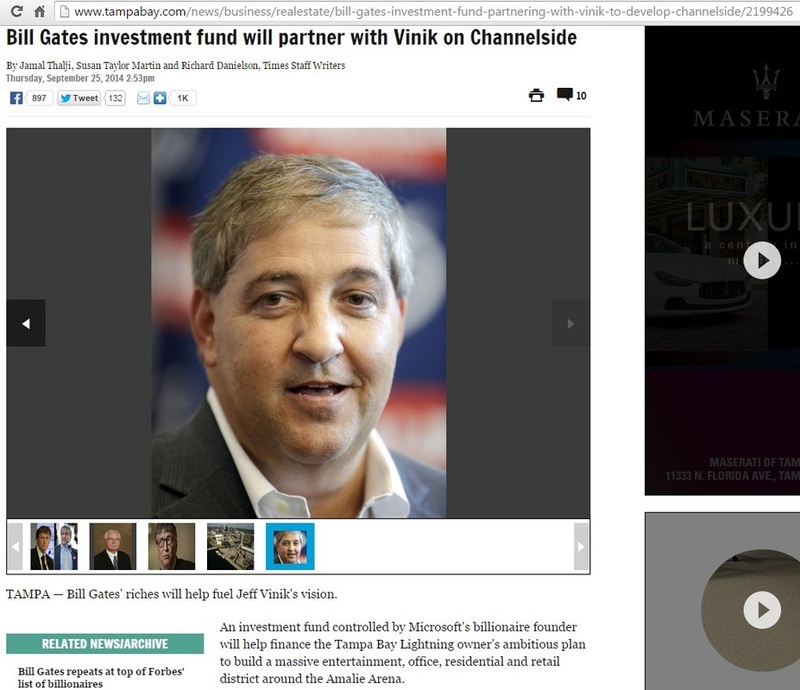 That’s the way Michael Larson, who oversees the Gates real estate investment empire, wants it. The Wall Street Journal said in a recent article that Larson’s job is to quietly grow the Microsoft co-founder’s personal wealth to help fulfill the mission of the Bill and Melinda Gates Foundation to fight disease, hunger and improve education in the developing world. 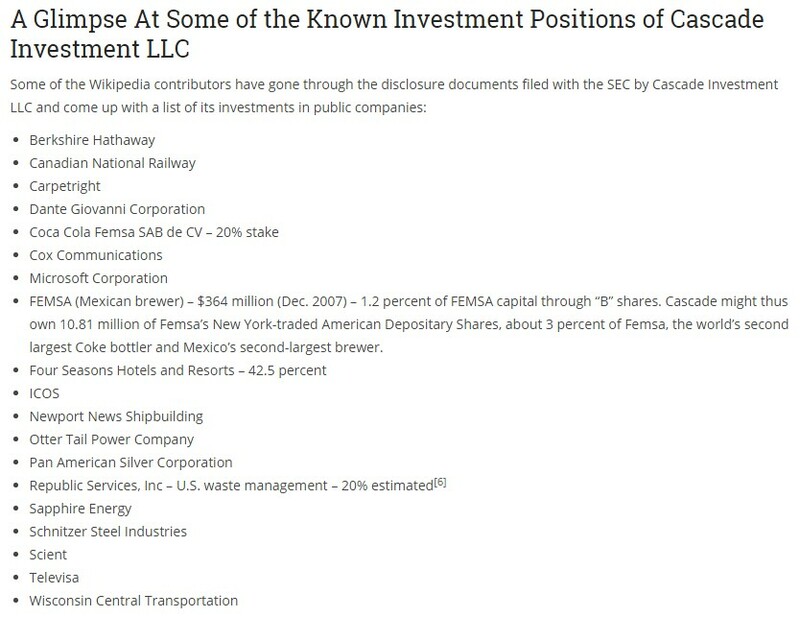 Larson runs Cascade Investments, headquartered in Kirkland, the Seattle suburb that’s also the home of Lakeland Sands Florida, according to Florida business records. 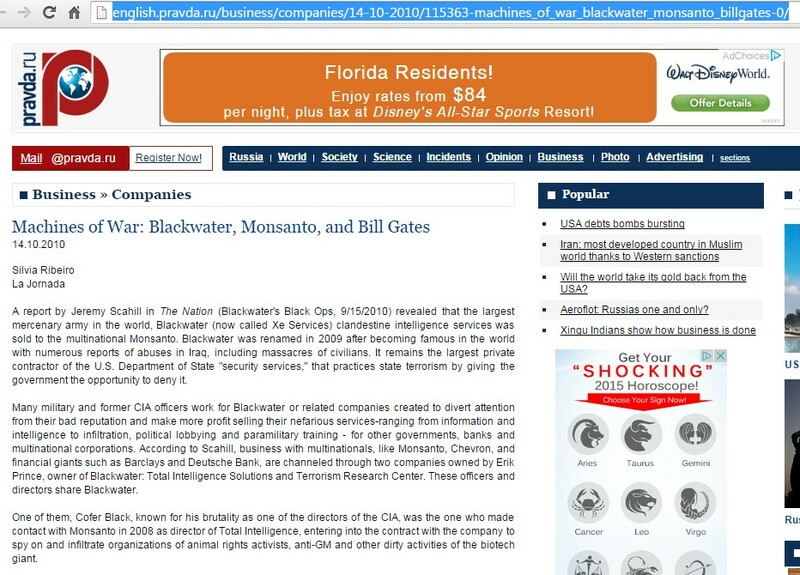 He is listed as the authorized agent for the Florida subsidiary. Cascade owns more than 100,000 acres of farmland in several states, according to the Wall Street Journal. It also invests in railroads, hotels, insurance firms, farm equipment manufacturing, energy companies, equity stocks and various other holdings. Real estate has been Cascade’s focus since the recovery from the 2009 recession that plummeted property values across the country, and especially in Florida. In the past two years, Cascade’s Lakeland Sands Florida subsidiary has purchased these properties in northern Florida: Coggins Acres LLC; Coggins Farm Supply, Inc.; Circle C Produce, Inc.; Absaroka Holdings, Inc.; Hamilton Land Investments, Corp.; Hamilton Pine Trees LLC, Lake Clarke Holdings LLC and Lee Peanut Farms LLC. Suwannee County commissioners said they were unaware of the connection between Lakeland Sands and Bill Gates. Commissioner Wesley Wainwright said he knew only that a large land tract near McAlpin had been sold at a premium, and that the same buyer purchased Coggins Farms in neighboring Hamilton County. Commissioner Jason Bashaw said he’d heard the Bill and Melinda Gates Foundation was getting into agriculture, but was also unaware of any related company buying local farmland. Contacted by the Suwanee Democrat, a spokesperson for the Gates family had no comment on the land purchases in Suwanee, Hamilton and Madison counties. That response was not unexpected. Gates and his Cascade Investments company seldom announce publicly its real estate acquisitions or other investments. The Wall Street Journal said the reason is to prevent sellers from inflating their asking price. Forbes magazine has estimated Bill Gates’ net worth at $80 billion, making him the richest man in the world. The Bill and Malinda Gates Foundation has an endowment of $41 billion. SOURCE Amber Vann is a reporter for the Suwanee Democrat of Live Oak, Fla.
Stanley Farms Sale "A Done Deal"
October 22-- The sale of Toombs County's largest Vidalia Onion operation is complete. Although it's been common local knowledge for weeks, principals in the sale of Stanley Farms to a subsidiary of Microsoft founder Bill Gates have been mum on the sale. Warranty deeds and easement agreements filed this month occupy 140 pages in the deed books of the Toombs County Clerk of Court and confirm the sale of Stanley Farms property and holdings to a company called Lakeland Sands LLC headquartered in Kirkland, Washington, also home to Cascade Investments, the Gates' private trust. Farm Owner R.T. Stanely, Jr. says he's been asked by the buyer not to comment publicly on the sale. He and his sons have been retained to run the company for the next few years. The exact amount of the multi-million dollar sale is unavailable. An industry publication, The Produce News, published a story which wondered why Bill Gates wants to be in the Vidalia Onion business and why his people don't want to talk about it. Click on this link to read the story by reporter Chip Carter. In its third generation of growing and shipping produce from the Vidalia, Ga. region, the Stanley family has apparently sold its operations to entities owned by Microsoft founder Bill Gates. The corporate paper trails in the Georgia and Washington secretaries of state databases include names of several holding and investment firms, but Vidalia onion insiders say it is common knowledge that the Stanley Farms operations, including Vidalia Valley, Manning Farms and Vidalia Onion Farms are no longer owned by the family headed by R.T. Stanley Jr.
“We are looking at this as a positive thing,” said Bob Stafford, manager of the Vidalia Onion Business Council. “Bill and Melinda Gates have a real interest in agriculture and farming with their different programs to help end hunger. None of the Stanley family was available for comment Oct. 17. They have about 4,000 acres, with about 1,000 of them in Vidalia onions, according to their company website. The Stanley family sent a letter to vendors and suppliers Oct. 1 stating the Washington company named Stanley Produce Georgia had bought the family's operations, according to The Atlanta Business Chronicle. Stafford said he had heard of the letter. He said the Stanley operation is the second Vidalia onion farm to be bought by billionaire Gates. “He bought Coggins Farms (Lake Park, Ga.) a couple of years ago,” Stafford said. A December 2012 document in the Washington secretary of state’s database show Coggins Farms’ “governing person” as Michael Larson. It shows Larsen at the same Kirkland, Wash., address as Lakeland Holdings LLC, listed in the database as the “governing persons” for the new Stanley Produce Georgia entity. Larson was not immediately available for comment Oct. 17. The Washington secretary of state database shows Stanley Produce Georgia LLC filed incorporation papers Aug. 22. On Sept. 22, an entity named Stanley Farms Georgia LLC registered with the Georgia secretary of state as a “foreign” entity with an address in Kirkland, Wash. Vegetable sales agent Marker 29 Produce Inc. is closing its doors after its major grower started its own sales agency. In mid-April, the Onancock, Va.-based vegetable broker was winding down operations after two former salesmen helped create a new sales organization for Coggins Farm and Produce Inc., Lake Park, Ga. That company was Marker 29’s biggest grower-shipper. Blackwater Produce LLC, Lake Park, established by former Marker 29 salesman Harry Sheaffer and Steve Sterling, along with principals at Coggins, now market the grower’s vegetables. 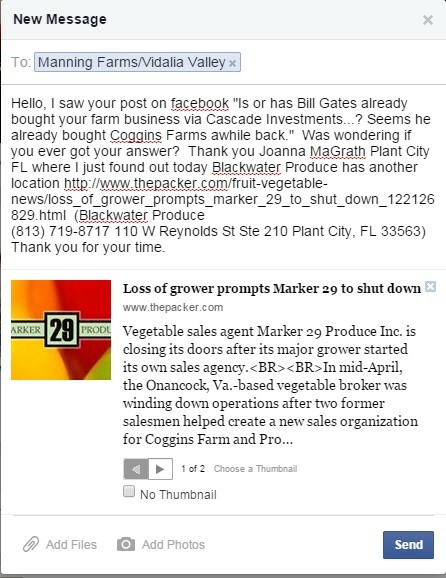 Sean Cornelius, who worked at Marker 29’s Plant City, Fla., office, Kevin Coggins, Mike Coggins, Sheaffer and Sterling are co-owners of Blackwater, a separate company that markets bell peppers, cucumbers, squash and carrots from Coggins Farm. the marketer plans to sell for new growers under the Blackwater label, Sheaffer said. Blackwater, through Coggins, has growing and consolidation operations in Fairfield, N.C., Hudsonville, Mich., and Plant City. The company is transitioning from the Coggins Farm label this summer. Cody started Marker 29 in 1997 after the demise of the Onley, Va.-based Farmers Exchange Inc., which was once one of Virginia’s largest vegetable shippers. 2214 J Frank Culpepper Rd. 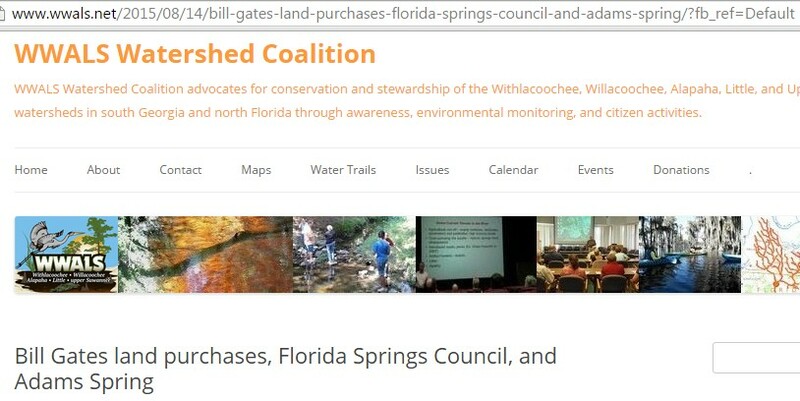 Bill Gates land purchases, Florida Springs Council, and Adams Spring.